Logan Boulet, a Humboldt Bronco who saved 6 lives. wen was born in renal failure and started dialysis treatments at only one month old. Owen’s parents, Sarah and Travis, were faced with talk of a kidney transplant for their baby boy. They were excited to find out that Travis was a perfect match to be a living donor for their son. However, the transplant could not happen until Owen was big enough to receive an adult-size kidney. Follow us on: Travis, dad and living kidney donor, with Owen in 2018. David Foster enjoying the sunshine at the Oak Bay Beach Hotel with kidney transplant recipient, Coen. his is another exciting summer for the David Foster Foundation. We are preparing for a series of intimate events that will raise money for the increasing number of families who require financial assistance while their child goes through the organ transplant process. This past April, I was heartbroken to hear the news of the Humboldt Broncos bus crash and the devastation it caused. Logan Boulet was among the lives taken in the tragedy. Logan’s family knew that organ donation was important to him and because of this Logan’s organs went on to change the lives of six transplant patients. This heroic action was able to shine light on a unique way that individuals could show their support—by becoming a registered organ donor. Canada saw a remarkable surge in organ donor registration rates following the news of Logan Boulet and his family. The exact number of new donors can not be reported as not all provinces have an online registry; once again emphasizing the need for a National Registry in the future. It is incredible to see how far organ and tissue donor registration has come in Canada, but there is still a lot of work to do. We are so grateful for our supporters who have helped us raise awareness for the importance of organ donation. This year, we will be having a series of smaller events that will raise funds for our families, while increasing organ donor awareness. On July 30th to August 2nd we will be hosting our four-day Simply Spectacular Experience on Vancouver Island with David Foster. This will be an exciting and intimate event including world-class entertainment and breathtaking views of Canada’s west coast, all in support of our incredible families. Thank you to our partners, donors, and many volunteers who understand the importance of a family staying together and what it means for them to have a place to turn to when they need it most. I hope this summer you will be able to take some time to be with your family and friends and cherish every moment together. “Canada saw a remarkable surge in organ donor registration rates following the news of Logan Boulet and his family.” Jim Treliving, Dragon from CBC's hit show Dragon's Den, and founder of Boston Pizza, with Michael Ravenhill at the 25th Annual Boston Pizza Foundation Invitational which supports organizations that mentor kids to reach their full potential. magine if your living expenses suddenly increased by nearly 50%. How would you respond? What would you do? An equally sudden and striking action would be required. This is what we at the David Foster Foundation are currently facing. The number of families requiring financial support from the David Foster Foundation has increased exponentially in the first half of 2018—climbing towards a 50% increase from last year’s numbers. This sudden and unexpected demand can be explained by an increase in organ transplant opportunities due to: •	New medical processes and procedures that were previously unavailable. •	More registered organ donors. •	Greater organ donor awareness due to media coverage following events like the Humboldt Broncos tragedy. •	An increase in donor family resources at hospitals. This is incredible to see, but it means more families than ever before will require financial assistance while their child goes through the life-saving organ transplant process. THE 50% CHALLENGE: In order to provide the necessary financial assistance to the anticipated 50% increase in families needing our help, while maintaining an endowment fund to ensure the David Foster Foundation will always be here for families to turn to, we need to raise one million dollars between now and the end of the year. No donation is too small. Every donation, be it from your children’s lemonade stand, corporation, personal savings, or family foundation, is a valued and important act of kindness. Together, we can ensure no family has to face financial devastation to be by their sick child’s side. If you have fully committed your donation dollars for 2018, please consider making a commitment today that will be fulfilled in 2019. For more information, please do not hesitate to contact me directly at Jdanson@davidfosterfoundation.com or 416-865-4646. The most common question I am asked as the Senior Vice President of the David Foster Foundation is, "What is the process for a family to receive funding from the David Foster Foundation?" The abbreviated answer: at each hospital across Canada that performs pediatric organ transplant surgeries, there is a transplant team comprised of medical professionals and a social worker that assists the patient’s family. This team works with the family to determine the level of financial assistance they will require for their non-medical expenses while their child goes through the organ transplant procedure. The social worker then works with the David Foster Foundation to assure the family receives the funding they need. At the end of the day, our goal is to keep the family as one, pre and post the child’s life-saving organ transplant. Gary Torgis, Executive Director of Aird & Berlis LLP with John Danson, SVP David Foster Foundation. Aird & Berlis LLP is one of our proud National Partners that for the past five years, has generously hosted the DFF Toronto office. As well, Aird & Berlis has donated five million Aeroplan Miles to assist families with travel to their medical procedures. ational Organ & Tissue Donation Awareness Week has been recognized in April for over 20 years now. Each spring, we are grateful to share our message during a time that is dedicated to increasing organ donor awareness. It is always amazing to see the creative ways individuals and organizations inspire others to get talking about organ donation. This year, the David Foster Foundation celebrated with a new approach—a major commuter billboard campaign! Thanks to the donation of media space from OUTFRONT Media, we were able to share our message across 160+ digital billboards in Vancouver, Calgary, Edmonton, Toronto, and Montreal, creating an average of 800,000 daily impressions. What was the David Foster Foundations important message? 90% of Canadians support organ donation, only 20% are registered. This needs to change. Even more surprising than the statistics themselves is that they have not changed in the past five years. We are proud to partner with OUTFRONT Media to bring attention to these numbers and why they need to change. The great news is—it is easy to be a part of the solution. If you haven’t already, please visit davidfosterfoundation.com and register your consent for organ donation today. Keep an eye out for our billboards from OUTFRONT Media. Thank you for the support! his past spring, Gavin’s family celebrated his first transplant anniversary with his new heart. Gavin was born in the spring of 2016 with a rare congenital heart disease known as Shone’s syndrome and received his life-saving heart transplant in May 2017. Gavin’s mother, Candace, stayed by her son’s side at the hospital in Edmonton while his father, Matthew, worked in Calgary to support their family. Matthew made the six-hour round trip to be with his wife and son at every opportunity. The David Foster Foundation was grateful to be connected with their family to provide financial assistance during Gavin’s transplant journey. Travis and Owen at SickKids Hospital during his transplant journey. Owen brings his family and those around him so much joy. He loves singing, dancing, building with Lego, and playing on swing-sets at the park. His family will cherish every moment together this summer. Owen is most looking forward to swimming, playing with his cousins, and going to the zoo. He loves animals and wants to see elephants at African Lion Safari. When he grows up he wants to be a superhero! Sarah and Travis will always be grateful for the incredible team of people that made their son's transplant possible. Gavin is all smiles post-transplant. Matthew holding Gavin while he was listed waiting for a new heart. n May 23rd, the David Foster Foundation had the privilege of attending a Toronto Blue Jays Game with some very special guests. Each year, WestJet donates their Blue Jays box to their Cares for Kids partners to make this evening possible. Rahmat, 10 years old, had a kidney transplant this past March and attended the game with his mother and sister. Tanika, 10 years old, had a double lung transplant in July 2016 and attended the game with her mother and father. This brave little girl also had a leg amputation from below her knee a couple of years ago due to a viral infection, but this does not stop her love of dance! Brandon Newman, from National Partner OUTFRONT Media, joined us with his wife, Clare, and their kids, Jonny and Ben. The marketing team from our other National Partner, Aird & Berlis, cheered alongside our families. It is always amazing to have our National Partners and donor families together. In between innings, the WestJet box was like a playground with the kids cheering, running around, and enjoying each other's company, as well as a buffet of food. Clare, Ben, Rahmat, kidney transplant recipient, and mother Faye in the box. Rahmat, kidney transplant recipient, and his family enjoy watching from the fabulous WestJet box seats! We would like to thank our friends at WestJet and the WestJet Cares for Kids program for giving us the opportunity to take some very deserving families out for a fun night and let these kids enjoy being kids. Tanika, double lung transplant recipient with her parents. Registered organ donor and hero, Logan Boulet of the Humboldt Broncos. April 22nd to 29th, and was followed by a number of incredible awareness campaigns powered by heroes like Logan. he Foundation was proud to participate in National Organ & Tissue Donor Awareness Week (NOTDAW), from April 22nd to 29th, and celebrate raising awareness the entire month of April. The Canadian Blood Services reported at least 99,742 new registrations in April 2018. This number only included provinces with online registries: British Columbia, Alberta, Manitoba, Ontario, Quebec, and Prince Edward Island. Thank you to everybody who answered a call to action—whether it was opening your heart to the idea of becoming a registered organ donor for the first time, verifying your registration within your province, educating yourself on why registration is important, or having a conversation with a friend or family member— you have truly made a difference in the lives of so many. Let’s continue this conversation. There are still 4,600 Canadians on the organ transplant waitlist, with approximately 1,600 new patients added each year. Jack Adamson created a fabulous campaign featuring a special organ donation story each day through NOTDAW. 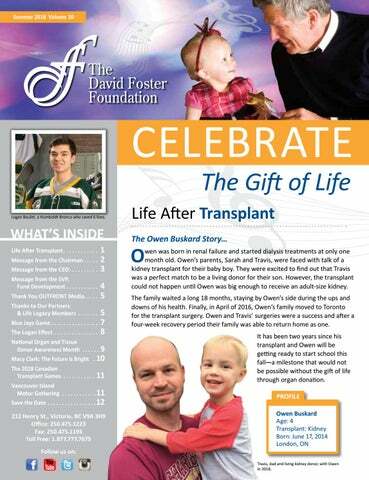 Please visit davidfosterfoundation.com to register to be an organ donor. The "Gift of Life" flag flying high! #LightUpGreen was seen across Canada on all major landmarks. 2-time heart transplant recipient, Evanne Fisher, and her mom, Tamara, were also featured in Jack Adamson's campaign. hen Macy Clark was one year old, it was discovered that she had a genetic disorder causing damage to her liver. Macy’s condition was monitored with biannual check-ups at the IWK Children's Hospital in Halifax and she went on to live an active lifestyle with little evidence of the disorder for the next three years. In August of 2015, Macy contracted an infection and her liver condition declined. Macy’s specialist at IWK referred her to Toronto SickKids hospital for a transplant assessment. Macy’s assessment in Toronto would confirm that she would need a liver transplant to survive. Macy’s mother, Ashley, underwent testing to determine her eligibility to be a living donor for Macy. Less than a week later the family received the news that they had been praying for, Ashley was a match. The transplant was scheduled for just eight days later, three days after Macy’s fourth birthday. Her shirt says it all: the future is bright. Macy’s family had little time to prepare themselves for the transplant procedure. Fortunately, they were connected with the David Foster Foundation and the Foundation was able to provide financial support to their family while Macy and Ashley underwent their surgery. Today, Macy is an energetic, kind, and ambitious little girl who is always looking for ways to help others. Macy’s favourite activities are skiing, tennis, swimming, running, biking, painting and gardening. This summer, she is especially looking forward to biking and planting her vegetable garden, as well as visiting family around the Maritimes. She would love to visit Alberta to see more family and to ski the mountains in Banff. Macy loves the outdoors and enjoys hiking, biking, and gardening. When asked who her hero is and why, Macy said Logan Boulet, because he inspired so many people to become organ donors and saved six lives. She has her pink hockey stick out on the deck in honour of Logan and his teammates. 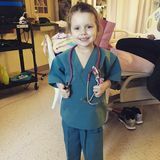 When Macy is older she would like to become a doctor so that she can help people. Macy loves to be active and participates in a variety of different community runs. This year was Macy’s third consecutive year participating in the Transplant Trot and she completed the kids' 1 km and adults' 5 km course. Her family and friends look forward to the event every year as an opportunity to celebrate their gratitude for Macy’s transplant. he Canadian Transplant Games will be held in Vancouver, British Columbia this year from July 2nd to July 7th. The games have been held every two years since 2000 in an effort to bring more awareness about the importance of organ and tissue donation in Canada. This is an opportunity to recognize the success of transplantation and the ability of transplant recipients to lead active and healthy lifestyles following their transplant procedures. The event provides hope to the thousands of Canadians currently on the transplant waitlist, and celebrates donors and donor families for the Gift of Life they have given to others. To learn more, please visit canadiantransplant.com. The Canadian Transplant Games—Team Canada! he 7th Annual Vancouver Island Motor Gathering will be held on Sunday, August 26th, at the Vancouver Island Motorsport Circuit in the heart of Cowichan Valley. Last year's event raised over $174,000 in cash donations for the David Foster Foundation and the Cowichan District Hospital Foundation. It is always incredible to see the track bring people together for a fun-filled day that gives back within the local community, as well as across Canada. Join us this year to see some of the most beautiful cars and motorcycles on the west coast in support of a good cause. Come say hello at the David Foster Foundation tent for interactive activities, facts, and information on the importance of organ donor registration. Young advocates showing their support towards organ donation! We are proud to partner with GAIN and the Vancouver Island Motorsport Circuit and look forward to another great summer of making a difference. For more information on the Motor Gathering, please visit motorgathering.com. The crowd gathers to check out all the fabulous cars on display!